I do not want to sound like an advertisement, but I sure love my cross-country shoes! 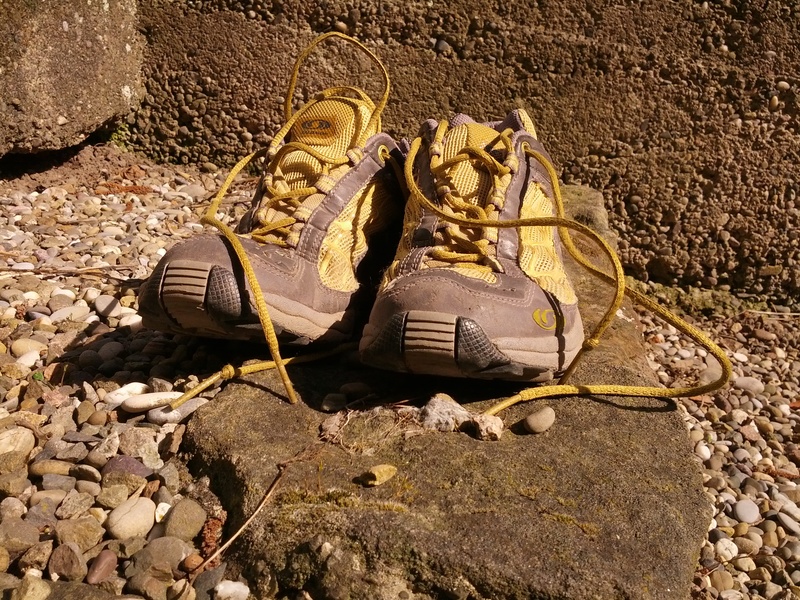 They do not look like much but they are broken in and comfortable. More than that, they are light weight! The little holes allow the shoe to “breathe” and feel lighter. For me it makes a difference. As I am not very athletic I need all the help I can get! Our verse for today talks about being weighed down in a race. The race is metaphor for the Christian life. It is to be run with our eyes on Jesus, who is the Leader and Source of our faith. The cloud of witnesses is a reference to all the great women and men of faith in the previous chapter. They are our examples and our goal is to run in faith as they did. Being slowed down by sin is something I can understand. What the “weight” might represent can be any number of things that are neither good nor bad in themselves. What might be a weight for me may not be a weight for someone else. The point is not so much what it is, but what it has the potential to do….slow us down. What is slowing me down? Am I distracted looking at the other runners? Am I bothered by guilt for my past? Am I plagued by doubts? The following verse tells me I am to keep my eyes ahead on Jesus. Lord, help me run unencumbered and focused on You! This is a sound machine. I find myself explaining what it is quite often when I travel by air. The security people often look baffled and concerned over it! 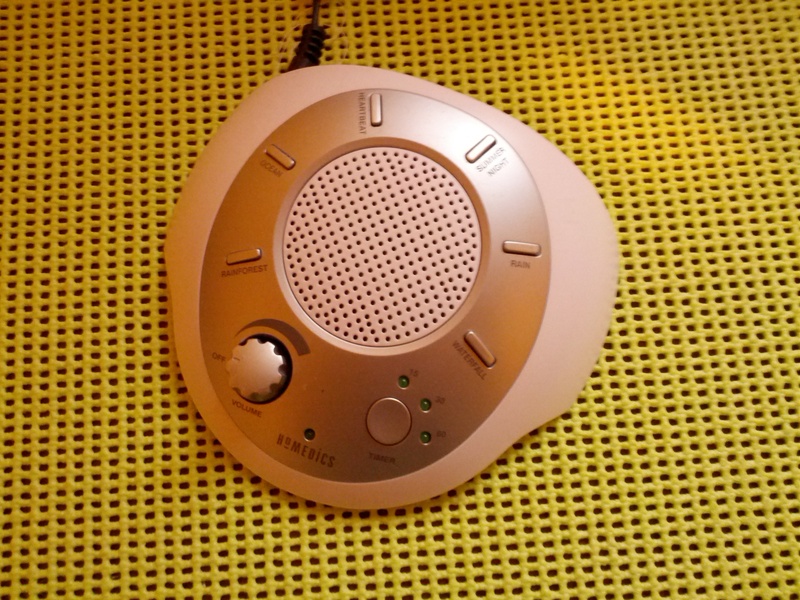 Unfortunately, I cannot sleep without this constant white noise, as it blocks out all other sounds. It does need to be constant though. The choice of sounds includes ocean waves. I never pick that one as I find myself always waiting for the next wave! Our verse for today is a clear command. The context of this verse speaks of false prophets who do wonders and encourage others to follow after false gods. But there is only one voice to which we are to listen, and that is His voice. We are to listen to His voice with a desire to obey Him, serve Him, and cling to Him. There are plenty of other voices out there that clamor for our attention. Their voices can be quite persuasive, especially when their fulfilled predictions seem to authenticate their message. But if their message deviates at all from the Word of God, then we are not to listen. Let it be white noise. Believers are like sheep who recognize and follow the voice of their Shepherd (John 10:27). His voice is like no other. He knows and speaks our name. Mary, at the tomb, recognized the voice of Jesus at the sound of her name coming from His lips. His voice is worth listening to as He speaks love to my heart. His voice woos and calls. It is a voice I want to follow and obey. Help me to listen for Your voice today. Categories: God's Word, Guidance | Permalink. 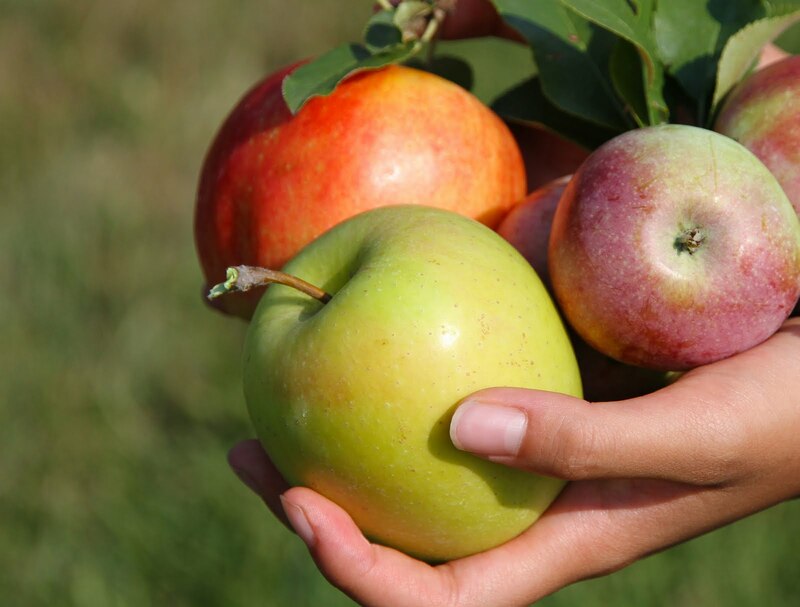 There are hundreds of varieties of apples available in Alsace. No wonder apple tartes are such a common dessert here! Their names are just as beautiful as the fruit; Belle de Pontoise, Ariane, Nonpareil, and my favorite…Coeur de Boeuf (Heart of Beef) just to name a few. Their apple cider vinegar tastes wonderful and I have a new appreciation for homemade applesauce! Our Scripture for today mentions an apple, but of course a different kind. The apple of the eye refers to the central aperture of the eye. The phrase, “apple of the eye” is used to describe someone who is loved and cherished. We are the apple of His eye as we are loved and cherished. One of the names of God conveys this truth; the name, “El Roi” meaning, “God Who Sees.” It was first used with Hagar in Genesis 16. Being the apple of His eye means that He not only sees but He cares. David knew that he was the apple of God’s eye, loved and cherished. In Psalm 139 he recognizes that God saw the slightest detail. God even saw when David was sitting or standing (verse 2). I never have to wonder if God sees. I am always in His line of vision. Our verse actually gives two images. They both have the same idea of protection. Nothing gets past the God who sees. I am the apple of His eye and He loves me. Nothing comes into my life without His knowledge and permission. Categories: Faith and Trust, For Foodies, God's Love, God's Strength and Power | Permalink. 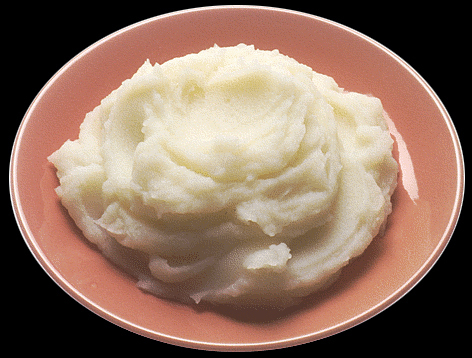 I can not look at mashed potatoes without thinking about purity! It is because of a story I heard when I first arrived in France. There was an American preaching to a church. He was new at speaking French and said something that made everyone laugh aloud. He said that the church needed to be more concerned with purée! He meant to say the word for “purity” (pureté) but instead said the word for mashed potatoes! Ever since, I have connected the two. And for those who might be wondering, no, it was not my husband! Our verse for today tells us how as believers we can keep ourselves pure. First, we are declared righteous by placing our faith in Christ and His righteousness. But as we follow Him, we can keep ourselves pure by continuing to fix our hope on Him. He is working in us to make us like Him. It is a process that lasts a lifetime. But one day, that process will be complete. My hope being focused on Him is what motivates purity. Having that eternal perspective changes how I live and think and choose. To be pure like Jesus is a very lofty goal. But what is different about striving towards this goal is that the outcome is assured! Knowing that keeps me from being discouraged. Yes, Lord. Help me keep focused on You and pure like You, for Your name’s sake. Some people may call me lucky. 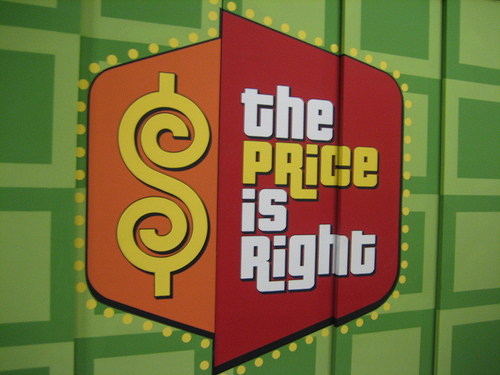 I was a winner on the game show, The Price is Right in 1984! We happily sold my winnings valued at four thousand dollars and took a second honeymoon in France! Because of this trip we found ourselves as residents of this beautiful country a few years later. Was I lucky, or what! We often wish each other good luck, or comment that something was lucky. But for those of us who belong to the Lord, we know that in fact there is no such thing as luck! If He is in control of everything, including my life, than nothing is really left to chance, good or bad. Our verse for today gives credit where credit is due. If the Lord wants to shower me with winnings, He will do it. If He wants to bless me or not bless me with material wealth, than it is His call. His plans for me are good and I can trust Him. I have heard so many stories of lottery winners whose lives have been radically changed. Some of their stories are surprisingly sad. It is not riches that produce happiness. I am not any happier because of my winnings all those years ago. What was reaffirming to my faith was to see how God used that circumstance in my life! Good luck? Bad luck? Dumb luck? With God’s control there is no luck! I would much rather commit everything to Him than to trust to the impersonal idea of luck. No, I am not lucky, but I am blessed. 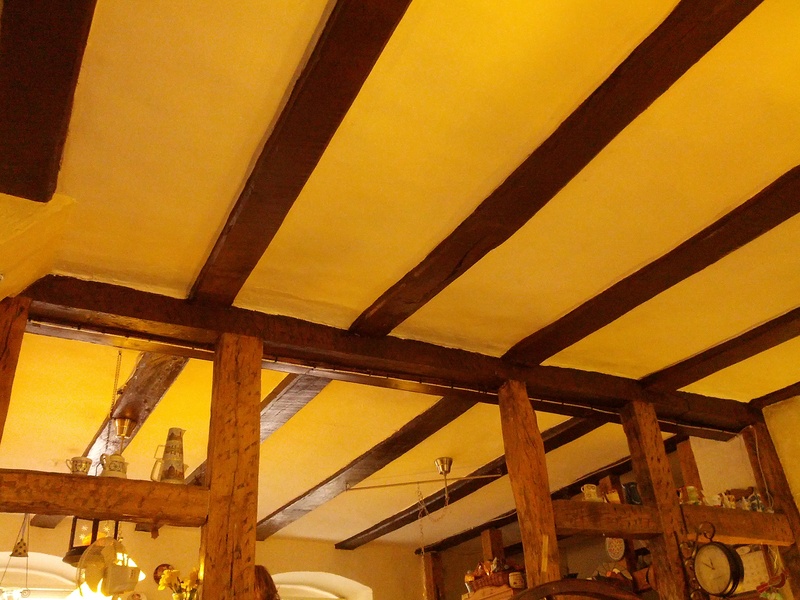 The beams pictured here are from the oldest home in a village in Germany. They date back to 1357 and they are just beautiful! They add such warmth and coziness as well as stability to the ceiling. I see lots of these beamed ceilings in Europe. I shudder to think what the termites in southern California would try to do to them! The beams spoken of in our verses are not seen in such a positive light. In fact, they are not seen at all! They represent our own failings and weaknesses. We do not like to see them nor do we want to see them. It is much more gratifying to be in the business of “speck removal” for our brothers. These verses certainly do not discourage helping our brother see his weaknesses in a spirit of love. However, what we mean to be helpful can actually hurt our brother when we have not examined ourselves first. This image of a beam and its relative size to a speck is ludicrous! It is just as silly for me to be overly concerned with minutia in my brother’s life. I ought to be more concerned with my own beam removal. As uncomfortable as it is to examine myself, I sure do not want my own specks to become a beam! Lord, keep me speck and beam free! Categories: Forgiving Others | Permalink. 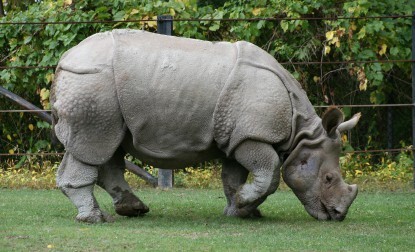 This Indian Rhinoceros is quite impressive. His hide being segmented looks like body armor. His shoulders and upper legs are covered in wart-like bumps. And what is really amazing is that his skin is four centimeters thick! It is understandable that he has very few natural enemies being so large and thick-skinned. Being thick-skinned is a treasured value in our world today. If one is thick-skinned then one can avoid emotional hurt. Insults, name calling, and gossip have no effect. The thick skin becomes an armor to verbal attack. All of this sounds good at first glance. But for the believer following God’s Word, there is a problem. Our verse for today tells us to be tender-hearted. If we are tender towards others than we can be kind and we can be compassionate. But if our hearts are tender for this purpose, than our hearts are also vulnerable to attack. Thick skin would not be possible. Thick skin on humans is just a myth anyway. We are all fragile to one degree or another. If that were not true, than there would be no need to be told, “Be kind to one another.” Having a tender heart means we will be hurt, which is why the next words are about forgiveness. When we are tender towards others than we feel their hurts and we feel our own as well. But the wonderful part about having a tender heart rather than thick skin is that I can realize Christ’s forgiveness for me! The uncomfortable conviction of His Spirit can penetrate a soft heart. My tender heart can experience His complete pardon. Lord, do not let me grow thick skin! Categories: Forgiving Others, The Body of Christ | Permalink.